With over three million Indians in North America and an overwhelming proportion of them being Hindu, temples are springing up everywhere. With so many temples now in North America, it may be time to reassess how we need to incorporate features suitable to the regional weather patterns in North America. Organizationally, Hindu temples in North America are structured after American churches with bylaws, membership eligibility, membership dues, elections, and governing bodies (president, chairman, secretary and myriad committees). 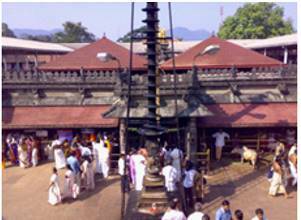 Mookambika Temple, Kollur, Karnataka, believed to have been started by Adi Shankara, 1200 years ago. In other measures, many Hindu temples here resemble Protestant denominations we see on TV in their perpetual appeal for money — tax deductible, of course — for capital projects one after another. With these things in place, disagreements and fights among members on dogma, rituals, and other practices also are the norm in temples, as in churches here. maintain these “Indianized” façades. But as we have seen time and again, this does not always go well, especially in places in the Midwest and Northeast and in Canada with several freeze-thaw cycles in winter, freezing rains, storms that pile 8” to 10” inches of snow on the complex “Indianized” structures. Cracks in plaster and between brick layers, snow freezing into sheets of ice and inadequate drainage on flat roofs lead to leaks and structural damage. In many temples, these are recurring themes that drain the temple’s time, energy and resources. 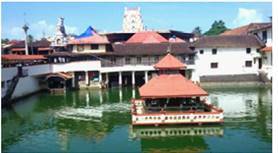 The famous Krishna Temple, Guruvayoor, Kerala. weather patterns? The urge to find costly engineering solutions to retain the Indianized façades with “new & improved” building material is irresistible. But Mother Nature always wins if we do not learn to respect Her ways and adapt ourselves to Her patterns. It is time to look at this with some Vedantic detachment. all these, we have crossed every line that was a Lakshman Rekha or taboo just forty years ago. We have seamlessly adapted our personal lives in so many ways to fit into the ever-changing lifestyles and resources around us. So why do we resist the common-sense-based need to adapt the temple structures to the entirely predictable local and regional weather patterns? After all, Sthapatis, the traditional Hindu temple architects in India, have understood these local realities through the centuries. That is how and that is why many temples in India have survived for several hundreds of years on very low maintenance, compared to temples built in North America in the last 50 years. Besides, there is NO ONE Indian Model in temple designs. 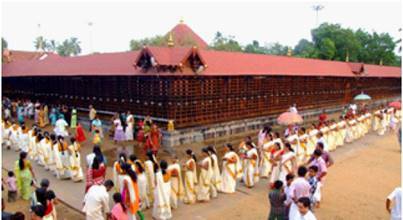 Consider this: In Kerala and Coastal Karnataka where annual monsoon rainfalls are over 70 to 80 inches, even famous temples rarely have Gopurams/Shikhars we see in other regions. Shrines and exteriors in these temples have simple, sleek, sloping roofs with baked tiles or copper sheets so that minutes after the rainfall, not a drop of water stays on the roof. See the pictures in this article. Further, every temple in India is built with materials locally available in abundance — like soapstone, sandstones, granites, laterite, and hardwoods such as teak. 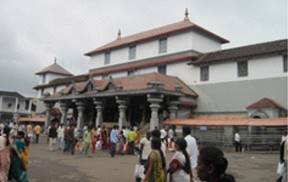 Temple managements need to develop guidelines and give them to architects to come up with low-maintenance, yet elegant structures for the sanctums for the deities and the exterior. Maybe we need to “Indian-Americanize” the temples’ exteriors and incorporate architectural features taking into account the regional weather patterns, similar to how we have “Americanized” our Indianness here. Compromises are inevitable. Only when the temple managements do this, can They focus on the real purpose for building temples — namely, educating our children, organically enlivening the core of the cultural features of our faith (like music and dance), organizing classes on Yoga & Mediation, and preserving our open-architecture philosophical traditions. This entry was posted on January 6, 2018, 12:00 pm and is filed under January 2018, Past issues. You can follow any responses to this entry through RSS 2.0. You can skip to the end and leave a response. Pinging is currently not allowed.